The way forward for our Faith is not an easy one, but most worthwhile things are not easily obtained. Discipline and commitment are vital for any movement, spiritual, physical or mental; huge patience and perseverance are needed. Our path will not always be exciting or glamourous, ¬we are the road builders; we may not be the ones who later walk down that road in this life. We may be ridiculed or scorned, lies and smears may be made against us, and some of these may even come from those we trusted. We are the ones who must make the greatest sacrifices now – sacrifices of time, effort and money – so that our children, and their children, will benefit. But each sacrifice, each gift, receives a gift in return; maybe not wealth or fame, but a satisfaction that no gold could buy. There will be times of disillusion and frustration, because the restoration of our religion brings greater awareness with it. Suddenly it will seem more painful and enraging to see the ugliness around in our cities, the senseless cruelty, the ignorance, the destruction of land and folk. With deeper awareness come deeper troughs of gloom, but also higher peaks of elation. There may be times when we feel nearly crushed, with no strength to carry on; times when all seems doomed and hopeless. Then life can be bleak but we are not alone, ¬the spirits of our ancestors are with us, ¬the Gods are with us – we need only to look for them within ourselves, and around us, within nature. They bring the strength to overcome despair. Each of us has access to that strength; it is in our blood, our hearts, and our spirit. The practice of Odinism will not make problems vanish, but it gives us the will to face, and the strength to fight against and overcome them. With the restoration of our community to our Gods and Folk Soul comes an inner knowledge, of ourselves, of our place in the Multiverse, the knowledge of a divine spark within each of us. We see the manifestations of the God Forces everywhere, around and within us. We see them in the vast majesty of a northern forest, in a single blade of grass; we hear it in the roar off a stormy sea, and in a child’s laughter. Whenever it manifests, we can recognise it. Yes, our path is sometime hard, but it is a noble way, and it is ours; OUR FAITH, OUR HERITAGE, OUR IDENTITY. We are of the Gods, and now is the time in which we have begun the restoration of the beauty of our Faith in Midgarth. It is we who hold the flame, we who must nurture the shoot. It is we who must show our Folk the way back to their true Faith – their spiritual birthright. Be uplifted then, for Odinists say ‘yes!’ to life, and the high ones are with us. Hael to the Aesir – Hael to the Vanir! Hael to our faith, folk and families! 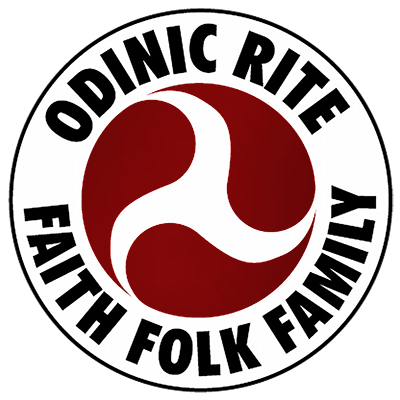 Odin’s people – stand firm!